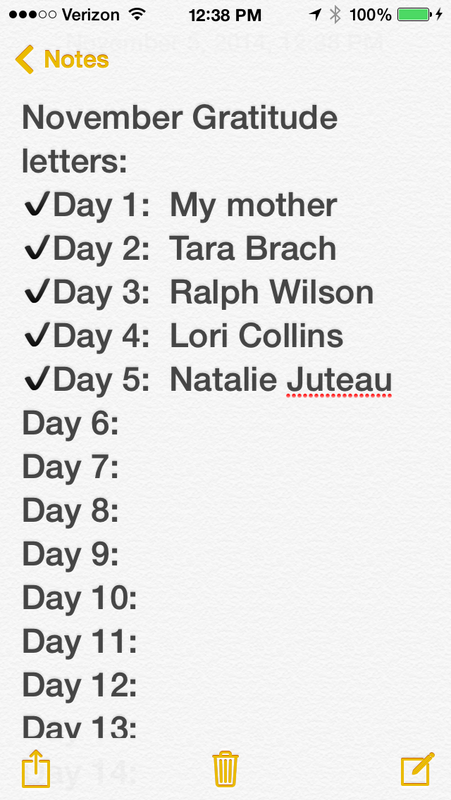 Day 5: today’s letter was written to Natalie Juteau. She’s a blogger from Colorado State University. 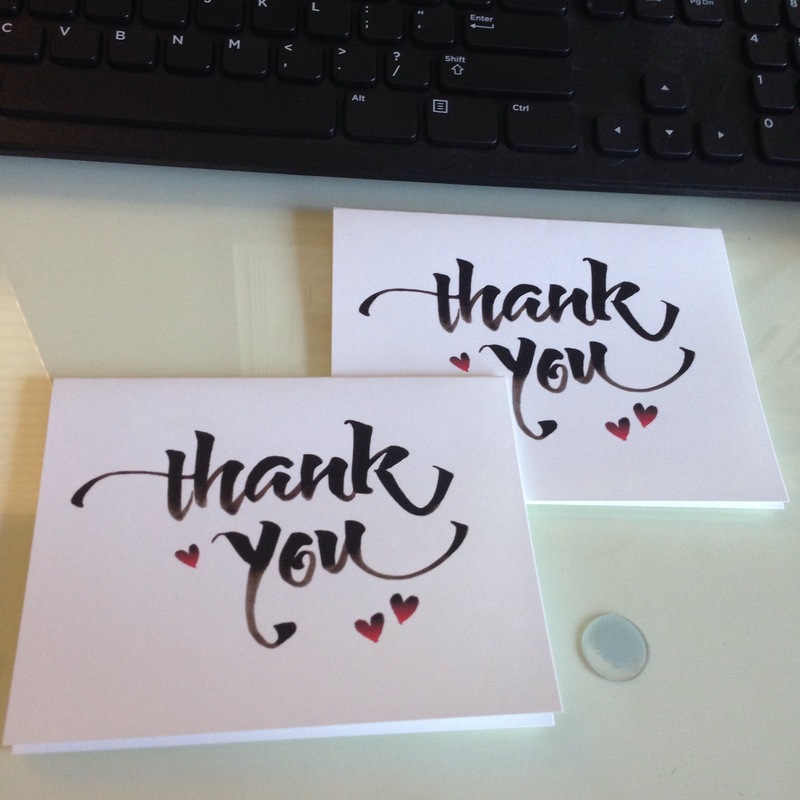 She wrote this article, X’s and O’s: The power of the written word X’s and O’s: The power of the written wordand of course it resonated with me so I used my new Thank You notes made by Karin Gable to write to her. Natalie is an English major and wants to be an author. I wish her the best with endeavor. I told her she could read from my blog and lack of perfect sentence structure and grammar that I clearly was not an English major, but none the less, I will hit send on blog posts to share my love of letter writing with you that also enjoy this form of communication. I didn’t have a physical address for her so just wrote to the university’s newspaper address and hope she does receive it, but if not, maybe she’ll just stumble across this blog post. Every day I’m thinking about more and more people, businesses and organizations I can and will be writing to in the days to come. Stay tuned! Last year on Facebook I remember scrolling through reading what friends were thankful for. Not discounting their health or family members, sunsets and pets, but I thought about being thankful to behind the scenes people, businesses I patronize and individuals I really don’t know but appreciate that we may interact with whether it be one time or someone I’ve have known for years. I decided to write a thank you note to them. 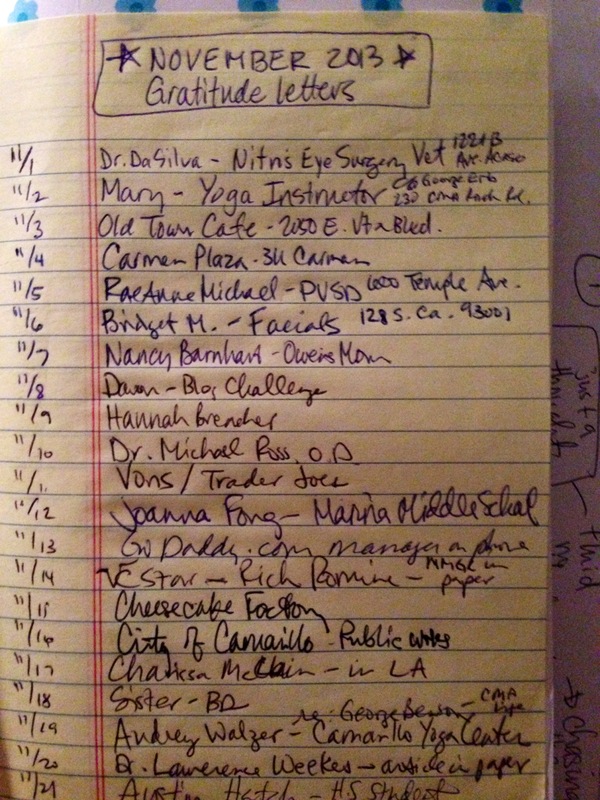 Below is a partial list from last year. Some days I wrote more than one and others where as situations came up where I couldn’t wait to get home to write one. I don’t think I’ll post who I write to daily, but when I do, I’ll share the reason behind why I’m taking the time to write the individual or organization. As I’ve been typing this I’ve thought of a few more. The list really is endless. I have much gratitude for others! Day 1: And, as it should be #1., My mother. We had lunch yesterday. We texted after and relayed how much we enjoyed our time together, but she’s still going to read it, in writing next week. 2. Last night we went to a football game. There was a man there who has been volunteering his time with the team for years. He’s a local businessman with a family, but I’m going to write him and thank him for his unimaginable hours he’s dedicated to our community. 3. A friend on Facebook who I really admire and respect isn’t on there much, (love her more for that reason alone) but when she does post something it is so thought provoking and usually a link to an article I enjoy or learn from. I’ll write to her and thank her for that. So there you have a sampling of what I’ll be sending. Anytime, just like in my last post when you write, don’t stress over the exact wording. These won’t be lengthly letters. I don’t know how they’ll be received-doesn’t matter. To unplug for a bit, take time to send thankful sentiments to others is what matters to me. 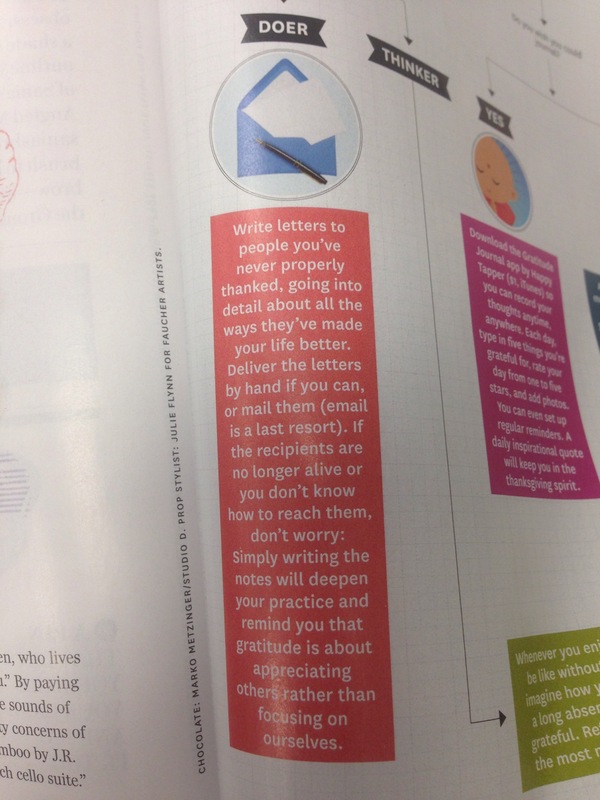 There are lots of books out there on this topic, but John Kralik’s, 365 Thank Yous: The Year a Simple Act of Daily Gratitude Changed My Lifeis a great short read and sure to inspire you to reach out to others in the form of a hand written letter. I hope you’ll be encouraged to write a few this month as we head towards Thanksgiving. I’ll look forward to comments of who you write to! Off social media for a month. I survived but the saddest news was learning a friend was diagnosed with breast cancer. Here is a card for her that says “I wish we could take back some days” Wishing her good health in the weeks and months to come. April is National Letter Writing Month! 1,000 views! Thanks for watching my TEDx talk! Why A Letter A Week?